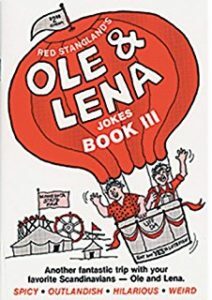 Ole and Lena books are common around Minnesota. I have had this one since I was a kid. specialty shops are big tourist attractions, such as the Uff Da Shop in Red Wing. We also have a Viking Ship and a stave church in Moorhead. One of the items you can find at most of these places are the Ole and Lena joke books. They are the Scandinavian-themed jokes that are as common as “This guy walked into a bar…”, but they are focused around marriage and gender differences. I did not see any of them while shopping in Norway, so I am thinking that these books were created for the Scandinavian-American market. I recently returned from a two-week genealogical trek across Norway, visiting the family farms of my paternal-maternal ancestors. My grandmother was 75% Norwegian (her grandma was from Sweden) and because of that, we celebrated a lot of the Norwegian traditions. I am guessing that since it was my grandma’s kitchen, it’s my grandma’s traditions. The first week of the trip was dedicated to my grandmother’s mother’s side, Quamme/Kvamme (saving that information for another blog post) and the second week was dedicated to my grandmother’s father’s side, Arnes(s). Both names were Americanized over the years (Norwegians rarely use Q and while settling in America, my paternal-maternal-paternal ancestors picked up another S). My dad arranged with relatives who he had met before to learn and trade some genealogical information. Svein Willy and Solveig (our hosts), were gracious enough to help us out by introducing us to more relatives! Throughout connections with all of these people, we learned a lot of family history. Their roles were to show us where they lived AND to learn about the family who did not come to America. 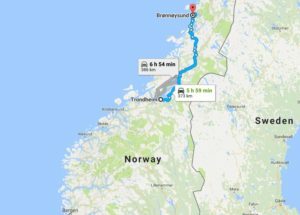 through the family tree, but a few days later, we flew up to Brønnøysund (pronounced Brrrune-knee-Syund), the city closest to where the family farms were (approximately 30-minute drive from the city to the farms). At this point, we are 75km from the Arctic Circle. 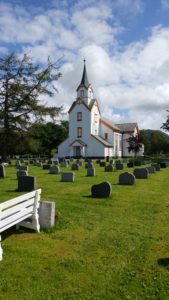 In Berg, half hour south of Brønnøysund, we met with Valborg and her children, who took us to the family farms and to the church where my ancestors attended before coming to America. The grave headstones were gone, but we found where their bodies were likely buried. Almost half of the population left Sømna (the region/county/kommune) in the 1800s because of economic hardships. The families had farms, but they really were only able to feed themselves and not pay bills. As Valborg repeatedly said, “their living came from the sea.” They had to fish in the fjords and then took boats to Bergen (southern part of Norway) to sell at the fish markets. I cannot imagine how that fish would have stayed fresh throughout their journey, but they knew what they were doing. Valborg purchased a wonderful resource for us: a book on people from the area who left for America. It is an amazing resource put together by local genealogists to identify the families who left (listing every individual), listing their farm, their destination, and when they left. What a terrific resource! And it is within that resource that we learned that my great-great-grandfather came back to Norway for a short time. But why? Sounds like a mystery I need to figure out. Valborg also gave us background on the two brothers and two sisters. Ole (pronounced “ooh-lah”) and Erik were two brothers who lived on a farm in Rørmark and Elen and Helena (or my Lena) lived on a farm in Ovrdale (pronouncned “oovr-dahla”). The farms are a five-minute drive from each other in our modern cars. Elen and Helena’s father died young and the mother remarried to a man 20 years younger than her. The new husband beat her up and was just awful, so she went and got a divorce from the priest. After her daughters were married, she went and lived with them in Rørmark , alternating between households. The two couples and mother moved to Arnes because it was closer to water and easier for them to fish. Helena accompanied her children to move to America (I believe Ole passed away before the move) and the rest is history.